Sacramento, CA alternative hip-hop artist Hobo Johnson is Frank Lopes Jr; often backed by his bandmates “The Lovemakers.” In November 2017, Hobo Johnson released the record The Rise of Hobo Johnson, which Frank wrote during a time he had to live out of his '94 Toyota Corolla - hence his self-given pseudonym. On April 17, 2018, Hobo Johnson released the highly anticipated single "Peach Scone" (both the studio and live version), which debuted on Spotify’s New Music Friday. (Listen to "Peach Scone" here.) 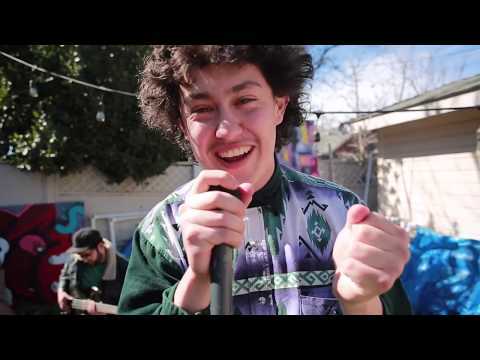 The new single comes on the heels of Hobo Johnson's "Peach Scone" live performance video, which was posted online as a submission for NPR’s Tiny Desk contest. The live video of that unreleased track got Hobo Johnson much more than expected. In just 7 weeks, the "Peach Scone" video racked up over 14.6 million views on Facebook and YouTube. Across all socials, their followers have grown from 10,000 total to well over one million followers. Their fervent new fans boosted the 2017 The Rise of Hobo Johnson album to #8 on the iTunes Hip-Hop chart and #11 on Billboard's Heatseekers chart.